English spelling is a really complex system, because English is a bricolage language, made out of many other languages. We learn how to do it, and then we forget how we learnt. Then learners ask us questions like "why does 'chemist' start with 'ch' not 'k' or 'c'?" or "how come 'chef' doesn't start with 'sh'?" and we can be left floundering for sensible answers. I've created Spelling Lists pages on this blog to help you sail through these sticky situations confidently, and give good, accurate answers backed up by plenty of examples. The menu of these pages lets you look up any sound and find all its spellings, or look up a spelling and find all its sound(s). For example, to answer the "chemist" and "chef" questions above, you click on the brown box (look up by spelling), scroll down to "ch" and you'll find three example words: chips, school and chef. Older learners often like to assist with choosing example words for each list – after all, they're the experts on which words they know and want to be able to spell. If there is a clear language of origin for the spelling, the page will say so – in this example, the ch in "chemist" comes from Greek and the ch in "chef" comes from French. The third box in the menu links to my suggested teaching sequence for spelling, and some of the teaching materials I've made, if you'd like to use them to follow this sequence (I am still working on the later part of this section, sorry). By "sequence" I mean starting off with just a small number of letters (I start with 5 letters which represent early-developing sounds, and which can be used to make 12 words of which you can realistically draw a picture), and then just keep adding one or two more sounds/spellings to make more and more words, till you've covered all the main spelling patterns of English. Mine is by no means the only possible sequence you could use – there are many different ones used in quality, synthetic phonics teaching materials. The important thing is to HAVE a proper teaching sequence for sound-letter links, and to follow it in an orderly way. 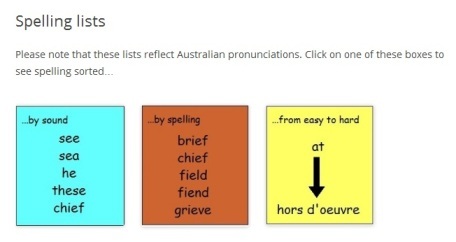 This entry was posted in blending and segmenting, consonants, sounds, spellings, teaching strategies, vowels on July 29, 2012 by alison.